The VARIOStore storage tent in Economy quality is the perfect companion for individual, temporarily, projects. It can be assembled quickly, and the side and gable panels can be partially or entirely omitted, according to personal wishes. 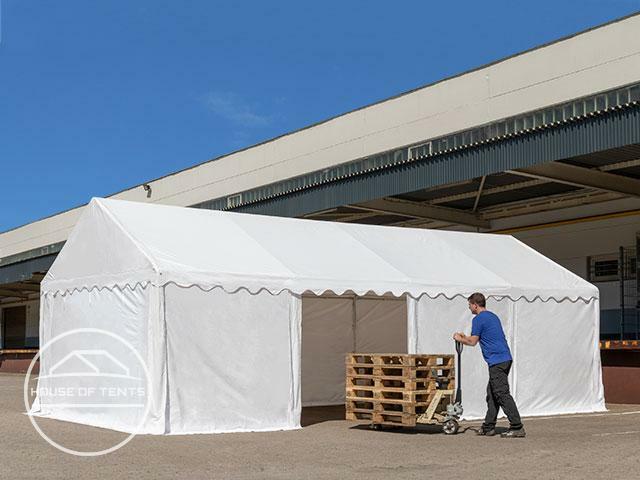 The economy storage tent has an easy-to-install galvanized, corrosion-resistant steel frame and a robust, 500 g/m² PVC tarpaulin. The PVC tarpaulin offers a high sun protection factor of 80+, is UV-resistant and is 100% waterproof thanks to welded seams. The tent construction is crucial for the solid stability of this tent. All construction components are firmly and reliably bolted together with a screwed-through system. In addition, the steel thickness and steel tube diameter are specially tailored to the requirements of this tent and make it robust and resistant. Fully galvanized steel pipes form an excellent basis. They reliably protect against corrosion and weather and are less sensitive to shock than e.g. powder coated steel pipes. 2:Bolting - A secure connection. 3:Feet - securely anchored to the ground! All steel pipes are fully galvanized inside and outside. This is resistant to impact and scratching and protects against corrosion. Bolting - A secure connection. Feet - securely anchored to the ground! At each pillar a foot element is firmly welded. 6:Each gable side has one entrance. 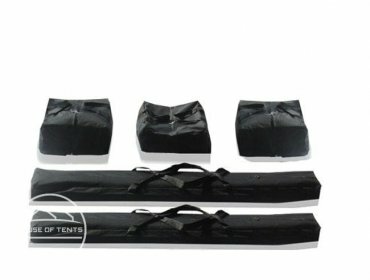 All tarpaulin elements are attached to the frame using bungees. The side walls are inserted at a distance of 2 m and can be variably installed or removed. The anti-hermetic system guarantees an excellent climate in the tent. Each gable side has one entrance. The assembly time is with 2 persons on average 1 hours. No problem! Our experts are happy to help. Just call us or chat with us, so that we can help you quickly and easily. It is best to keep the article number of the required spare part or your invoice ready. The article number can be found in the assembly instructions of your tent.